We are delighted to announce a call for sponsorships in the forthcoming contest: “How Online Networking Rocked My Business.” This will be a multi-faceted blogging and social media contest for small businesses and entrepreneurs, presented by BizSugar. 1. The contest will be open to small businesses and entrepreneurs. 2. Entrants simply need to write a blog post about how online networking has benefited their business. 4. The grand-prize winner will be the one whose article gets the most votes on BizSugar. We are offering a stellar opportunity to companies to sponsor and be a part of this engaging contest. This is no “enter and forget it” contest. Rather, it will involve ongoing engagement and activity across multiple websites and social media properties, by small business owners and entrepreneurs and their communities. To participate we are looking for sponsors who will provide a combination of cash and in-kind prizes. This is a very affordable contest for those who wish to heighten and reinforce their brand recognition and visibility among the small business community. 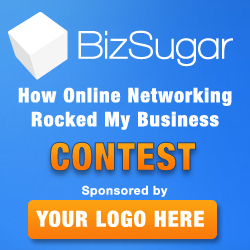 BizSugar is an award winning social media site with over half a million (500,000+) registered users. It is a platform for small businesses and entrepreneurs to submit, share and vote for the best business information articles on the Internet. It reaches hundreds of thousands of small business and medium-sized business owners and managers annually. The site’s mission is simple: we want small businesses and entrepreneurs to shine! BizSugar is part of the Small Business Trends LLC family of small business sites, run by CEO Anita Campbell. Our media partner for this contest is JustRetweet. JustRetweet is site used by social media savvy, influential bloggers to enable them to connect with like-minded Twitter users interested in similar content. Wao! This is going to be another great event for bloggers and entrepreneurs. Can’t wait to be part of it. Great event…looking forward to it.